Starting in January, the first fearful thing is Air Law & Operating Procedures. Followed in no particular order by Meteorology, Flight Planning & Performance, Navigation, Instruments & Electronics, Principles of Flight, Human Performance, Aircraft Technical & General, Radio Aids & Communication. These are all exams, good tribesmen and women of cyberania. The night Rating I hope to accomplish within two weeks, and Instrument Rating before the end of February. That’s the last 2 of 11 Fearful Things. Or a month an exam and is feasible – but challenging. That’s because I’m 52. Everything takes just a little longer to settle into my slowly atrophying memory cell, but that doesn’t mean its all bad. In fact, my age is a kind of blessing. Had this happened 20 years’ ago there’s no way I would be able to shoe-horn my hyper-active lifestyle into a proper aviation psyche. While this is all very well, this is all happening as Aviation experiences one of its worst years for accidents in living memory. Mostly concentrating in Malaysia. MH370 remains missing somewhere (we now know) in the Southern Indian Ocean. QZ8501 flying from Surabaya to Singapore and operated by Air Asia crashed early yesterday morning. Wild speculation continues about the cause. The reality is its the third major incident involving a Malaysian airliner. The other two Malaysian aviation disasters this year involved the state-run company. MH370 and MH17. The latter was reportedly shot down over Eastern Ukraine, apparently by Russian-backed rebels using a mobile ground-to-air missile. So why consider taking up aviation at this point, you may ask? I prefer to think of this in a different way. The three Malaysian accidents are all linked to the culture of doing business in that country. If you consider how the disappearance of MH370 was mishandled by authorities you’d see a country in a curious malaise where the paternal hierarchy leads to Big Man problems inside the cockpit. This is not my experience of aviation in South Africa. Sure there have been a couple of incidents involving corruption, but these have been rooted out and dealt with. So far. However, the SAA board fiasco is centred on executives. The pilots and crew who fly are in some ways distant from these shenanigans because they don’t earn enough money to warrant some drooling ruling party connected lackey trying to steal a pilots license in order to garner a few rands in a dubious tender. Its one thing to lie about your matric or some little BA degree from Unisa to plant your bum on a butter seat in the SABC or SAA executive, its another trying to lie your way into the cockpit of a commercial jet by flashing a bogus CV. Ruling party connections won’t help you land a plane. I’m waiting for some lickspittle type to try. Then we can all watch as he or she flies straight into the granite cloud, screaming something about the aeroplane being reactionary. Yes, the pilots are very well paid but compared to actually taking control of an executive position – its peanuts. So we’re safe for the moment from the grandiose largesse-based bribery plaguing the upper echelons of SAA making its way directly into the cockpit. The foot soldiers of aviation continue to ply their trade in an honest way because its just too difficult to make it all the way to captain and 10 000 hours by being “politically connected”. These are the fine gentle-folk whom I would aspire to emulate and eventually don my commercial pilots license wings with matching flashing toothy smile. But before leaving you, a note about in-flight Doppler Radar. The Cirrus I plan to fly around tonight has the Garmin 1000 with a great deal of weather reading technical gadgetry. This includes the pilot-adjustable horizontal scan angles of up to 120° allowing me to focus on trouble areas, vertical scanning which beads in on storm tops, gradients and cell buildup at various altitudes. It also comes with Weather Attenuated Colour Highlight (or WATCH), which allows a pilot to identify areas beyond the radar’s capability that may contain even more hazardous areas of precipitation. 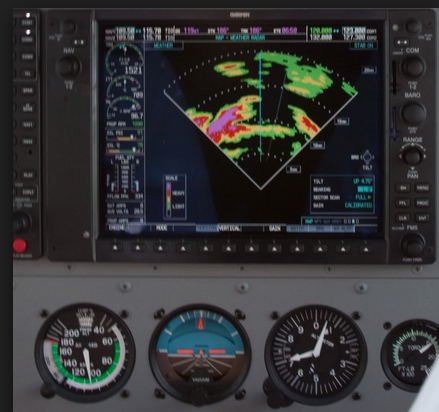 Garmin 1000 weather warning system. Which is all very well. However, if you’re already at 32 000 feet and want to avoid a cumulonimbus towering to close to 50 000 feet, go around. I’ll be tottering along at 7000 feet in a propellor driven plane and in a training area, which means I can skedaddle back to Lanseria if the weather gets bad. The Cirrus SR20 has a ceiling of 17 000 feet anyway. So what happened to QZ8501? Without resorting to rampant ill-informed speculation, reports from professional pilots and aviation authorities suggest the Airbus may have entered an area of extreme turbulence. Between that fact and the reality the plane has crashed, we await further information. This entry was posted in Uncategorized and tagged aviation accidents, Malaysian Aviation, political aviation, QZ8501, SAA, SABC by desmondlatham. Bookmark the permalink.